Humboldt County’s Redwood Coast welcomes the holiday season with the sounds and sparkling lights of Christmas the weekend of November 30-December 2, 2018, and Christmas events continue through December. 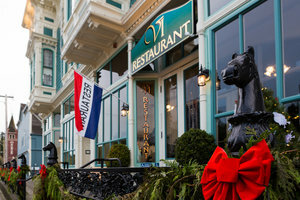 Staying at The Redwood Riverwalk Hotel in Fortuna, means you’re close to performances, shopping, tree lighting, and more in Eureka and Ferndale. A bonus – the serenity of the many State Parks nearby provide perfect places for a break from your busy holiday calendar. You can take a hike, bike ride, or just a scenic drive to relax and enjoy the natural wonders that surround you. A spectacular way to begin your weekend getaway to the redwoods is the 29th Annual Candle Light Walk at the Prairie Creek Redwoods State Park visitor center. The event will be held both Friday, November 30 and Saturday, November 1, 2018. The Park is a little over an hour’s drive north from The Redwood in Fortuna. The event begins at 5:00 pm with appetizers and an auction. At 6:00 pm, guests begin their ranger-guided Candlelight Walk through the ancient redwoods on a path lit by 400 luminaries. After holiday storytelling by North Coast Storytellers, they are welcomed back to the visitor center for cookies and cider while the auction continues until 8:00 pm. Don’t wait to purchase tickets – this popular event sells out fast! Tickets: $10.00 per person, free for children 12 and under. Go online to purchase tickets for Friday, November 30, 2018. Go online to purchase tickets for Saturday, December 1, 2018. Closer to Fortuna, the Eureka Symphony and Eureka Symphony Chorus will present their Holiday Concert: The Trumpet Shall Sound on the same evenings, November 30, and December 1, at 8:00 pm. The highlight of the performances will be Handel’s Messiah, a Christmas season tradition. A free “Musical Notes” lecture begins before the concert at 7:00 pm. Tickets: $19.00 – $49.00; student tickets half-price; children under 12 free (2 free with adult ticket purchase). Even closer, just a 15 minute drive from Fortuna, Ferndale offers three different ways to kick off your weekend getaway. Ferndale Repertory Theatre will present A Christmas Story on Friday and Saturday evenings at 8:00 pm and on Sunday at 2:00 pm. Produced in collaboration with Humboldt Light Opera Company, it’s perfect holiday entertainment for families of all ages. Dates: Fridays, Saturdays, and Sundays November 23 – December 16, 2018. Tickets: $18.00 adults, $16.00 students (15-college) and seniors (60+), $10.00 youth (ages 3-14). A $2 Historical Building Preservation Fee will be added to each ticket. If you’re in the mood for an old-fashioned Christmas and some special holiday shopping, Ferndale hosts its Victorian Holidays, a series of Friday night street fairs from 5:00 – 9:00 pm. Each Friday until Christmas, visitors can enjoy festive music, activities, shopping, costumes and more on brightly decorated Main Street. Last but not least, you can get in the wintry spirit of the season any day of the week with some ice skating at the Humboldt Ice Skating Rink from November 30, 2018 to January 6, 2019. Hours: Fridays & Saturdays 10:00 am-10:00 pm, Sundays 10:00 am-8:00 pm, Mondays – Thursdays 2:00 pm-8:00 pm. Admission: $12.00 for adults, $8.00 for children (include skates and 90 minutes on the ice). Whatever Friday holiday event you choose, your unique Humboldt County holiday will continue when you return to your hotel, The Redwood. Its proud sense of place reflects the unique environment and history along the Redwood Coast. Saturday morning, enjoy our complimentary, full buffet breakfast served daily from 6:00 – 9:30 am and get ready for another fun-filled day. You can head for several great holiday events in Eureka, including the 38th Annual Humboldt Artisans Crafts & Music Festival. It’s held from Friday evening, November 30 through Sunday, December 2, 2018. Get in the holiday spirit with five stages of live music and dance entertainment that showcases local talent throughout the Festival. If you still have holiday shopping on your list, the festival features over 130 booths of gifts hand-crafted by north-coast artisans. Of course, there’ll be plenty of holiday treats and cheer to enjoy, too! Sunday, December 2, 2018, from 10:00 am – 6:00 pm. Admission: $3.00 or free with a toy donated to the Humboldt Bay Fire Department toy drive. Free after 5:00 pm; free throughout the Festival for children and seniors. There’s more music in Eureka’s Old Town. You can listen to a concert of Christmas Carols by Tuba Christmas on Saturday, December 1, 2018 at 1:00 pm. Back in the Victorian Village at Ferndale, Saturday evening and Sunday afternoon feature the 49th Annual Christmas Celebration in Song. You can listen to the more than 60 voices of the Ferndale Community Choir performing holiday music from around the world. The crowning event of the first weekend in December along the Redwood Coast is the Lighting of America’s Tallest Living Christmas Tree in Ferndale. Plan to be part of this old-fashioned holiday tradition on Sunday, December 2, 2018 from 5:30 – 6:30 pm. Ferndale celebrates its tree lighting with music, cookies, and cocoa, of course! The brilliant lights on this huge spruce tree shine for miles in every direction, welcoming visitors from far and near to a Victorian Christmas. 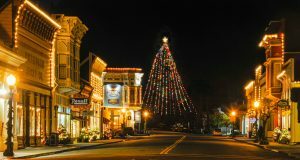 These are just some of the holiday music, lighting displays, shopping, performances and more you can enjoy during a weekend getaway to California’s Redwood Coast this December. Other events later in the month include the Truckers Christmas Parade in Eureka, the Electric Lighted Truck Parade in Fortuna, and the Christmas Lighted Tractor Parade in Ferndale, plus performances of The Nutcracker Ballet. Why not break away from the frenetic pace of urban/suburban life, and celebrate the season’s arrival in the beauty of the California Redwoods this year? 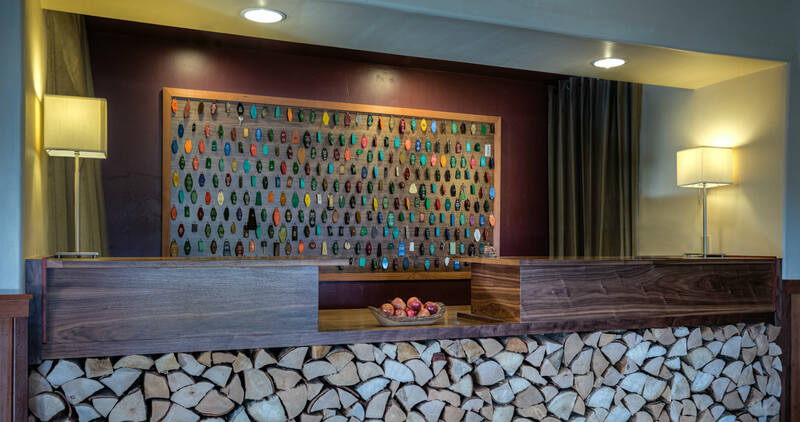 It only takes a moment to book your stay at our small, independent hotel in Fortuna. A warm holiday welcome awaits you! This entry was posted in Area Activities, Concerts, Festivals, Holidays, Theater, Things to do, Uncategorized and tagged CA redwoods hotel, Christmas, Entertainment, Eureka, Ferndale's Victorian Village, Fortuna Electric Lighted Parade, holiday, Lighted Tractor Parade, Lighted Truck Parade, Music, shopping by admin. Bookmark the permalink.